Magical Martinu (...) Martinu's score can have you walking a few inches taller or finding a spring in your step. (...) Here's a perfect introduction to him. Ashkenazy et Kolinsky (...) s'entendent remarquablement pour célébrer cette fête néoclassique (Concerto no. 2) qui évoque Stravinsky et Roussel. Selbstbewusste Pianisten-Virtuosität im engagierten Wettstreit mit einem stilistisch vielseitig beanspruchten Orchester (...) Die Einspielungen haben Atmosphäre, Atem und Engagement, das sich bisweilen zu glühender Intensität steigert. If you are looking for a single recently recorded disc to represent Martinu then look no further. As fine a Martinu release as has been released in this 50th anniversary year. (...) Ashkenazy responds to (Les Fresques's) rich and radiant atmosphere with a reading with real verve. (...) two of the finest Martinu concerto performances to have come my way for some time. (...) The Basle Symphony Orchestra play superbly. Thoroughly recommended. This disc showcases some of Martinu's most intriguing and appealing music for piano and orchestra. The two piano concertos receive splendid performances, and they are marvelous works--certainly two of the finest 20th-century compositions for piano and orchestra. 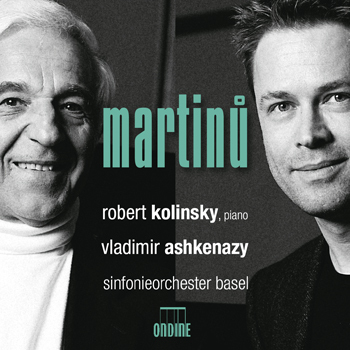 (...) Robert Kolinsky plays the piano part with a winning combination of improvisational fantasy and firm rhythm (...) while Vladimir Ashkenazy and the Basel orchestra accompany colorfully. (...) This well-engineered disc deserves very serious consideration. Recommended. Vladimir Ashkenazy houkuttelee Baselin sinfoniaorkesteri sielukasta, muhevaa soittoa (...) tärkeät rajapinnat erottuvat, samoin Robert Kolinskyn napakka ja menohaluinen pianismi. Ashkenazy (...) handles the very talented, young Sinfonieorchester Basel through this challenging, but rewarding world of Bohuslav Martinu. (Incantation) sounds like no other piano concerto I've ever heard, and this is a stunningly good recording. Keinen Zweifel kann es geben, dass die (...) Aufnahme Referenzcharakter trägt. This CD release pays tribute to Bohuslav Martinů on the occasion of the 50th anniversary of his death. Star conductor Vladimir Ashkenazy leads the Sinfonieorchester Basel through a selection of masterpieces of this great Czech-born composer, who died in Switzerland in 1959. The Piano Concertos Nos. 2 & 4 "Incantation" feature acclaimed pianist and Martinů expert Robert Kolinsky as soloist. U.S. journalist David Hurwitz once called the latter piece, "one of the [20th] century's most exciting and unusual scores for piano and orchestra." Also included are the Overture H. 245, as well as Les Fresques de Piero della Francesca, which remains one of Martinů's most performed works. This orchestral trilogy draws its inspiration from Martinů's 1954 visit to Arezzo and exudes the composer's impressions of the basilica San Francesco with its famous frescoes by Piero della Francesca. This recording was produced in association with the Internationale Musikfesttage B. Martinů in Basel, Switzerland, and is released to coincide with the 15th festival's opening. The booklet contains expert liner notes by Aleš Březina, director of the Bohuslav Martinů Institute in Prague, and rare photographs published with kind permission by the Bohuslav Martinů Centre in Polička.